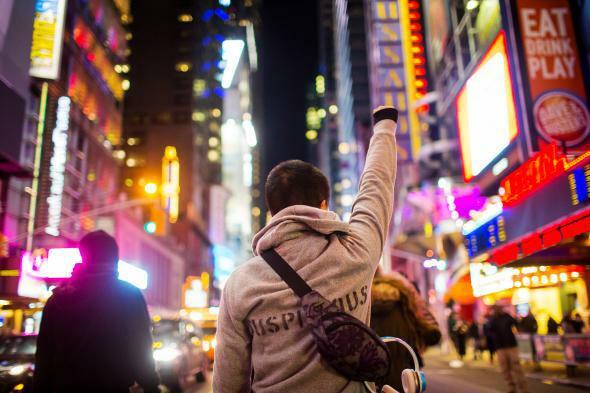 Protests continue over grand jury decision in Eric Garner case. A demonstrator in New York City. Demonstrations were held for the second night on Thursday in response to a grand jury’s decision not to charge a New York police officer with a crime for choking Eric Garner to death. Thousands of demonstrators took to the streets in protest across the country. Protests in New York City, the New York Times reports, “shut down the Brooklyn-bound lanes of the Brooklyn Bridge as a growing number of demonstrators marched from Lower Manhattan.” At least 2,000 people demonstrated at Foley Square, as “[p]rotesters of all races chanted ‘Justice! Now!’ and ‘Black Lives Matter!’ the New York Daily News reports. “Many held signs reading ‘The Grand Jury is a Fraud’ and ‘Our Democracy Can’t Breathe!’ in recognition of Garner’s last words — ‘I can’t Breathe.’” Protesters also took to the streets staging “die-ins” in opposition to police brutality. Demonstrations were also held in Washington, D.C., Boston, San Francisco, and Pittsburgh, among others.